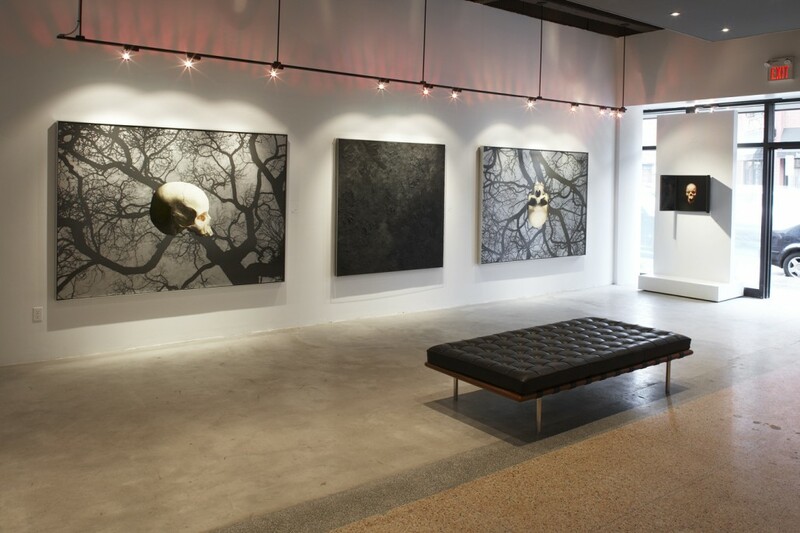 Galerie St-Laurent + Hill, 2009. Ok, here are my thoughts, about the skulls, the text pictures and the mirrors. The skulls are connected to the earlier bone works (and the reference to that series in your essay “Appearances are Deceptive” from the Index catalogue will be helpful), but I was 30 then and now I’m in my 40’s. In fact, I was 30 when I started the bones (32 when I showed them) and 44 when I started the Skulls. At 30 I was curious, at 40, I was mindful. I had experienced significant losses in my life, my father, and a number of good friends, my daughter had moved to University and my wife had lost both her parents. So I was thinking about eternity and loss and altogether feeling fairly impotent about my abilities in the face of that big thing, death and dying. I wanted to make a series of pictures that allowed me to indulge these obsessions, that allowed me to think about the people I’d lost—to make something that said “look, I haven’t forgotten, I remember you.” Work that allowed the narcissistic pleasure of thinking about my own appointment, the fear and the inevitable, what would be said at my own funeral; “Oh it would be a glamorous affair, with all sorts of my favorite rock songs playing and so on.” Five minutes of an adolescent indulgence like that can make a world of difference in a day. The Skull seemed the perfect way to start. It has a long history, is a wildly clichéd image (I love those) and is about as unequivocal as you can get—it says “death”, and perversely, says the opposite. For the bone pictures from the early 1990s the University of Toronto had provided me with access to their collection, for the Skull pictures I approached the university again and they agreed to lend me a specimen. I lived with it for a few weeks and photographed it in every way I could imagine, always with reverence and with ritual—that was important; I spoke to it, thanked it each day as I took it out and as I put it away and I made promises to it as well. I shot the head in 6×6, 35mm and digitally; with natural light, with lighting, on white, on black, on red, up, down, sideways, from below, from above, with the lower jaw, and without it. I know nothing about the head, where it’s from, its gender or its history — I didn’t want to know. For me it is a symbol, a metaphor for all those I have lost and remember, for my own fear and recognition of the inevitable, and for my doubt as an artist. The latter is a recent realization, and is an outcome of the series rather than a reason for it; Because of its history as a symbol, the very heavily trodden nature of this terrain, how can you say anything that’s worth listening to and looking at? So you make the pictures, release them and recognize the attempt at entry into that long and loaded conversation. 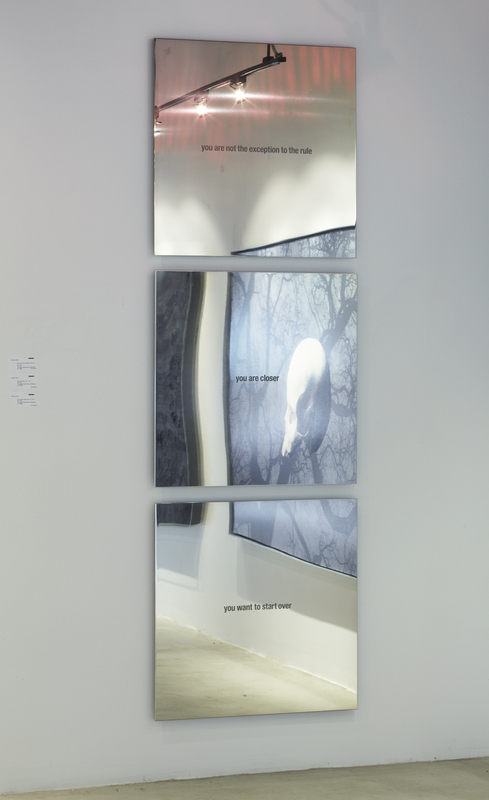 The text works, and their addition to this series, came about quite naturally. I had ideas about the skull, what it meant to me, what it could mean, and why I was using it. I wanted to manage some of that more effectively by altering the symbolic power this way or that way; like painting, using more of this colour or that colour to make slight changes to how something feels, its temperature for instance (placing the skulls in the trees for the “Not for Finding” show in Toronto was part of this process too). To begin, I simply wrote free form, almost automatically, a stream of consciousness and then boiled it down. The result is dozen text works, which may make their way into the larger pictures. As I began to work the text into the pictures and had time to reflect, I realized that we never imagine ourselves as flesh-on-bone. I realized that the skull would always be the “other” because we only imagine ourselves as flesh. I needed a way to adjust this reflection and make it circular in order that the “other” could become us—at least for a moment. How to adjust this clouded reflection of our entire selves? 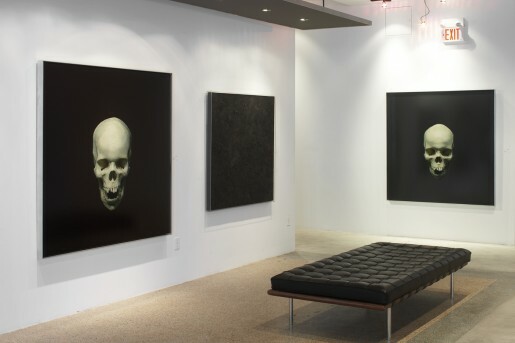 A mirror image adjacent to the large works challenges the viewer to see themselves in the bone of the skull as much as the flesh of their own visage: “There I am, right here — there I am too, over there”. So a mirror I look into each day, your mirror, “IMPERFECT HISTORY”, and the letter that accompanies it — the missing apostrophe notwithstanding — was the solution to this problem, and mercifully, has created for me a new set of problems so I can stop thinking about the “other” for a while. The above letter was sent to Ihor Holubizky in March of 2008. It seemed to me that the letter was as clear an attempt at an artist statement as I could manage. Hard to imagine, but it’s close to twenty years since imperfect history was shown—the only time. I know you were at the exhibition opening because there’s a photograph of us leaning against the window in Cold City Gallery: another artist took the shot and sent it to me. I don’t think that you’ve ever seen it, and it’s probably in my storage locker in Australia. Even if it’s gone, or never to be seen again, it will remain etched in my consciousness: embedded in that photograph is friendship. Meaningless to anyone else, but that’s not the point, and reasons why I wanted to have the remains of that work, which I passed on you a few years ago. The rest of the work had been dispersed—sold, given away, lost—and fitting as the elements came to me by chance and happenstance. I lived with them for years before the idea came to put them together. What you have, however, is the heart-of-the-matter, the stainless steel element—like a mirror, but not a mirror—with the phrase ‘Imperfect History’ sand-blasted onto the surface. I’m not entirely certain how the phrase came to me, but I started my academic journey as a historian. I found it frustrating because there was nothing I could do ‘about’ history, and at the same time realising that history can never be definitive. Points-of-view give us different meanings and interpretations of the same events. I slipped into art and then art history, and learned to love the imperfections, because in art—what artists do—the imperfect ‘mirrors’ the way our minds work and provides food for thought; the good, the bad and the ugly, as long as it’s not indifferent. The apostrophe you made note of, which went missing, has bothered me. I It was a found, hand-fabricated stainless steel comma, used to give a syntactical pause between the ‘mirrored’ element and the stainless steel shelf on which other (found) objects sat. Much later, I found a CAD-cut vinyl comma. Obviously not the same thing, nor the same size, but it had a history, and had survived; a perfect substitute for (your) Imperfect History. That comma is still with me, sitting on a shelf behind my office desk on Prince Edward Island. I will give it to you one day as soon as I solve the problem of how to ‘frame’ it. I’m humbled by the thought that the mirrored element and phrase has lead you down your own path: I’m happy to share it – to let you make something else and more of it. PS. 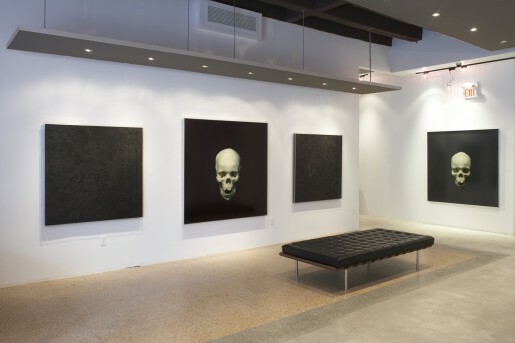 I’ve included the Bone Paintings passage from the 2005 MacLaren catalogue, as you suggest—for the reader, and for you. Yes, I’ve fiddled with the original. Can’t leave well enough alone. In the early 1990s, James Lahey was granted access to the Anatomy and Cell Biology Department collection of human bones at the University of Toronto Medical School for his visual research purposes. The genesis of the Bone Paintings, however, appeared earlier. Lahey came across a moose carcass in the woods on a fishing trip and brought some of the bones back. He became fascinated (the slow revelation) with the idea of bones, what is left after the flesh and the idea of Christian relics. The preparatory sketches have an affinity to traditional, academic still-life/nature morte painting and drawing, but represent an important, conceptual point of departure from his previous work. 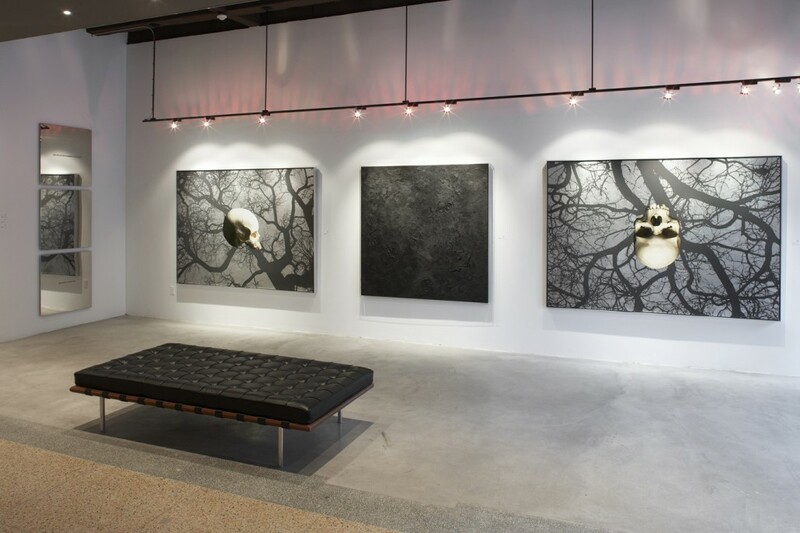 The resulting Bone Paintings provided Lahey a vehicle with which to explore modernist structure and archetype, addressing the appearance of things, and how things may become signs and symbols. The paintings may suggest a relationship to historical vanitas painting—a still life composition given meaning by symbolic association to reflect the brevity of life and the transience of earthly pleasures. But a bone in medical and scientific terms is evidence with respect to a forensic methodology. The Bone Paintings therefore, can slip back and forth, and their meaning and resonance depends on what the viewer brings to them.